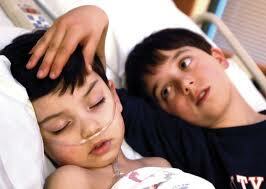 What Is Childhood Illness ? Childhood illness can range from relatively mild complaints to more serious diseases. The following guide describes how they affect a child and how to provide adequate protection and treatment. Of the diseases covered, diphtheria is by far the most serious. The fact that isolated cases have been reported recently means that parent must be sure their children have been immunized. Whooping cough, too, can be serious and again, immunization should be carefully considered. Being informed is the first step towards protecting your child from illness. For some illness, prevention through immunization is one way of ensuring that a child will not suffer from them. For other, learning to recognize the illness when the first signs appear may help to prevent serious complications arising. A child who is ill needs care and attention and, at the same time, parents need to know that they are doing the right thing. Knowing when to take a child to hospital is vital, but for some of the milder illness home treatment, backed up by medical advice, will be adequate. Parents should also remember that an infected child may have to be isolated briefly from other children. Scarlet fever is steel considered by many to be a severe illness, which necessitates isolation of the children in a fever hospital and carries the risk of unpleasant complications. But, fortunately, with modern medical treatment there are no longer great viewed as being more akin to a nasty attack of tonsillitis. In fact the only difference between some sorts of acute tonsillitis and scarlet fever is the latter’s skin rash. Both scarlet fever and certain types of tonsillitis are cause by the same bacterium streptococcus. However, the particular strain of this germ which causes scarlet fever also produces a toxin which in turn acts on the child’s blood and causes a red rash. One attack of scarlet fever gives the child permanent immunity against another attack, but this does not offer any protection against the many other strains of streptococci which cause tonsillitis. At one time any child who caught scarlet fever was extremely ill. Nowadays however, the strain of bacteria that causes scarlet fever has discovery of an effective treatment in the from of antibiotics has meant that symptoms are fairly short lived. The child first become ill about two to five after he has been in contact with the germ. There is a sudden start to the illness and the initial signs are usually of a high fever up to 40°C (140°dF) and a loss of appetite, often accompanied by vomiting. The younger child seldom seems to notice that his throat is sore, but frequently complains of a bad stomachache. This also happens in acute tonsillitis and is probably due to the lymph glands in the abdomen becoming enlarged in an attempt to fight off invading bacteria. The older child may complain of a sore throat and also notice enlarged and tender lymph glands in the neck. The rash usually starts between 48 and 72 hours after the child has become ill. The rash consists of very small red spots which appear on a flushed pink skin. They usually first appear around the neck, in the armpits and in the groin. They then spread to the chest and the rest of the body. The patient’s face is usually flushed, except for a characteristic paleness around the mouth medically known as circumpolar pallor. The flushed of the skin disappears for a few seconds if the skin is pressed with a finger. If scarlet is not treated promptly, the skin starts to peel after about one week, coming off in tiny flakes from around the small bright red areas of the rash. The peeling is most marked over the finger’s and toes, but may affect other parts of the body including the chest, abdomen, arms and legs. Usually the palms of the hands and the soles of the feet are the last areas to peel. At the start of the illness, the throat, including the tonsils, is bright red and there are usually white spots on the tonsils. The tongue is covered in white fur with little red protuberances or papillae white strawberry tongue. The white fur on the tongue disappears, leaving red papillae on a red tongue strawberry tongue. The symptoms of scarlet fever may often resemble other conditions. For instance, the appearance of the throat and tongue can also occur in acute tonsillitis. And, initially scarlet fever symptoms can be confused with measles and German measles or glandular fever. A definite diagnosis can be made, however, when a throat swab is taken and infecting germ tested. In the past, scarlet fever had serious complications, but fortunately these are now very rare. Before antibiotics were used the germ could cause serious septicemia and other parts of the body besides the throat could become infected with the streptococcus. Infection of the bone caused osteomyelitis. The glands in the neck could also become so seriously infected that they might cause abscesses which could burst. Later complications, starting two or three weeks after the onset of untreated scarlet fever could include infection of the kidneys (acute nephritis), which might cause permanent renal damage. This complication would start with fever and ‘Smokey’ urine. A specimen of urine from a child with scarlet fever may still be examined two or three weeks after the illness to make sure that there is no blood or protein in it; the likelihood of this happening, however, is very small. Rheumatic fever, which can cause permanent damage to the heart, also used to develop about a fortnight after the start of untreated scarlet fever. The child’s larger joints, such as the knees, elbows, shoulders and hips, would become acutely inflamed and the pain characteristically flitted from one joint to another. Inflammation of the middle ear (otitis media), however, is still a common complication of scarlet as it is of course of acute tonsillitis. Scarlet fever, however mild, is treated with an antibiotic: the effectiveness of this treatment means that after 24 hours the organism is no longer infectious. The perhaps take a throat swab and send it to the laboratory; but he will not wait for a report on the germs before prescribing an antibiotic for the child. Penicillin is normally the antibiotic chosen; but erythromycin may be used for a child’s urine will probably be examined two or three weeks after the start of the illness to make sire that the kidneys have not been affected. Scarlet fever today is rarely very serious and there is little risk of a child suffering further complications. Give prescribed drugs at the correct time, don’t miss doses and always finish the course if your child appears to have recovered. 2. At first, your child will not feel like eating. Don’t worry, simply ensure that he drinks plenty of fluids. A straw or an infant’s mug will make drinking easier and more fun. 3. Until the doctor says that your child can return to school, ensure that he rests quietly but there is no need for him to be in bed. 4. If your child’s urine looks ‘Smokey’ after he has apparently recovered, consult your doctor.